THE ELIOT STRIVES TO INSPIRE STUDENTS, TEACHERS, FAMILIES AND THE ENTIRE ELIOT COMMUNITY TO ACHIEVE THEIR HIGHEST POTENTIAL. THE ELIOT REMAINS FOCUSED ON ITS GOALS OF INCREASING STUDENTS’ READINESS FOR HIGH SCHOOL, ACCESS TO HIGHER EDUCATION AND SUCCESS IN LIFE BY TEACHING STUDENTS TO BE CRITICAL THINKERS, PROBLEM SOLVERS AND SOCIALLY RESPONSIBLE. IN THE JOURNEY TOWARD ACHIEVING THESE GOALS, THE ELIOT EMPLOYS FOUR KEY PRINCIPLES TO GUIDE STUDENT CONDUCT EACH DAY, WHICH ARE: “BE RESPONSIBLE, BE RESPECTFUL, BE SAFE AND BE KIND.” IT IS THROUGH THESE PRINCIPLES THAT THE SCHOOL HELPS ITS STUDENTS BUILD CHARACTER, SELF-CONFIDENCE, LEADERSHIP QUALITIES AND SOLID VALUES SO THEY BECOME POSITIVE CONTRIBUTORS TO THEIR COMMUNITIES. The Eliot is focused on development of the whole student—including physically, socially and emotionally. Our curriculum provides hands-on, project-based, interactive instruction to help instill skills that can be applied immediately to increase students’ independence and self-confidence. To help facilitate this, the Eliot subscribes to programs such as City Connects, which helps link children to a customized set of intervention, prevention and enrichment services in the community to help families improve their child’s academic success. A mentoring program is also available to students at all levels to help them assimilate with the school culture and improve academic outcomes. The Eliot’s instruction is driven through data and ongoing assessments that measure students’ aptitudes and progress. Students benefit from receiving lessons and enrichment planned in response to their changing needs based on continuous data collection. Eliot teachers have the freedom to go beyond the packaged curriculum to effectively engage all the diverse learners within their classrooms, ensuring every student makes successful academic progress. The curriculum also is dynamic in that it allows teachers to provide students with authentic reading and writing opportunities across all content areas, such as English, science and social studies. At the Eliot, both teacher and student engagement is viewed as essential, since engaged teachers create engaged and successful students. Teacher professional development is strongly encouraged, supported and funded at the Eliot, and instructors enjoy immense freedom in lesson and curriculum planning. In the classroom, teachers ensure student engagement through use of the workshop model, where instruction is given in small groups of students at similar skill levels. Another technique used to increase engagement in reading and writing is permitting students to choose books of interest to them. Both engagement methods bring learning down to a personal level, as students enjoy intimate discussions of material of interest to them. Not only does this engagement increase academic results, but it also creates life long readers and writers. At the Eliot, Arts instruction is viewed as critical to a students’ holistic growth, as research has linked participation in the arts to improved academic test scores. The Eliot provides special training to its teachers to help them incorporate more arts instruction into their teaching of core academic subjects. Manual arts, such as woodworking, are included in the curriculum for older students. Additional arts opportunities such as music (including musical theater, instruments and voice) are provided to students through programs offered both before and after school through the North End Music and Performing Arts Center (NEMPAC). With the Eliot’s location in the historic North End of Boston, students are easily immersed into the Italian culture. Through the Italian language curriculum, students learn not only to speak Italian, but also about Italy’s history and culture. Students experience hands-on learning through field trips to local businesses, such as Italian pastry and coffee shops, as well as other North End restaurants and cultural attractions. The Eliot is committed to providing physical education to its students, believing there is a direct correlation between physical health and a student’s ability to learn. Physical activity and instruction not only nurtures a healthy body, but also boosts student’s energy, stamina, concentration and self-confidence promoting better academic performance and success at school. The mission of the Eliot K-8 Innovation Upper School is to create a community of learners that strives for excellence in both academics and character. Our learning community is based on five guiding principles: Be Respectful, Responsible, Safe, Kind and Inclusive. We believe that each student has the potential to make positive choices of behavior that contribute towards your growth as an educated and responsible citizen. 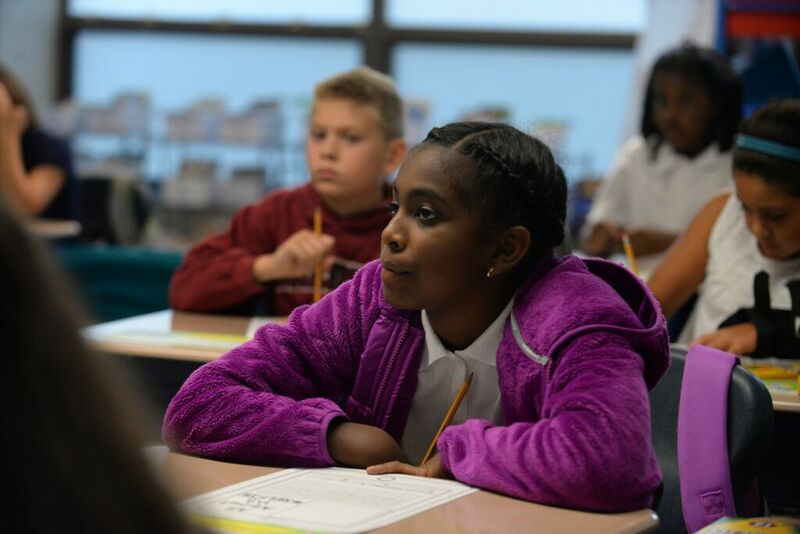 The purpose of the Eliot Scholars Program is to meet the developmental needs of middle school students with an emphasis on a student’s level of achievement and a student’s behavioral needs. The intent is to recognize that each student is on an individual development level and that a student’s level may fluctuate dependent on many factors. Through the autonomies provided by its Innovation School status, the Eliot chooses and creates curricula and assessment tools to best serve the needs of its students. It supplements existing Boston Public School curriculum with programs and interventions that target the precise needs of its diverse population, specifically students with disabilities and English language learners. In order to provide students with an exceptional curriculum and the best possible resources, the Eliot has partnered with a number of reputable organizations which share its philosophy of striving for a holistic, hands-on educational experience.